Off I went, undeterred, and as soon as I hit Capitol Street I breathed a sigh of relief. Small streets, nice architecture, trees. Taylor Books had a great vibe plus free wifi and coffee. None of my books were on the shelves, but I told myself that's because they're all over at the Book Festival, waiting for me to sign them at the Taylor Books booth! Stepping into the Farmers' Market felt like coming home. 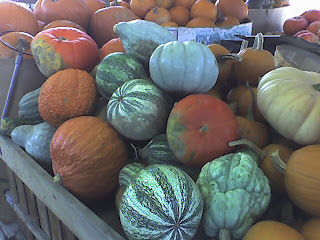 Just being around the squashes and apples made me forget about the concrete and red mulch back at the Holiday Inn Express. And as I walked past Frog Creek Books a title caught my eye: Bootstraps and Biscuits. The subtitle (300 wonderful wild food recipes from the hills of West Virginia) says it all. It'll make good plane reading later this afternoon, although I may skip the skunk recipes. Last stop: Ellen's Homemade Ice Cream (no web site). Sadly, I arrived 15 minutes before they opened so I couldn't try the ice cream, but I was able to convince the very friendly young woman setting up that I truly needed two t-shirts, since my name is Ellen and since I'm flying out directly after my presentation and won't have a chance to come back. Thank you, friendly young woman. Now I'm heading over to the civic center, for my presentation on small space gardening: No Space? No Problem! I hope I have a good crowd.